Collings special laminated construction semi-hollow equipped with Lollar Low-Wind Imperial buckers. The perfect "Aged Look" with the perfect Semi Hollow Tone !!! What a wonderful instrument !!! 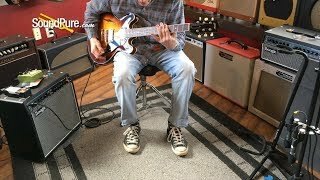 In this video, Sound Pure guitars specialist Eddie Berman tests out a pre-loved Collings I-35 LC Aged Tobacco Burst Electric guitar, through a Mesa Boogie Fillmore 50 Combo and a Strymon Brigadie dbucket delay pedal.